Members of the Hoodstarz gang. BROOKLYN — Reckless Twitter and Facebook posts helped police take down two gangs who terrorized a Brooklyn neighborhood with a violent feud, authorities said Thursday. 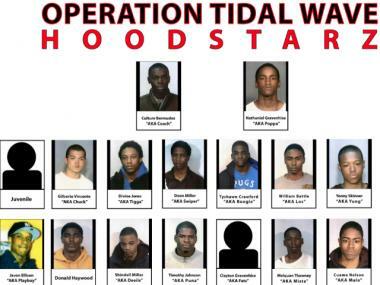 The Kings County District Attorney's office indicted 43 gang members on Thursday from the rival Wave Gang and Hoodstarz on charges of murder, assault, conspiracy, and weapons possession, among other charges. Cops investigated the two gangs for more than a year, keeping close tabs on their movements on the streets — as well as their activity online. Investigators watched as gang members bragged about their violent confrontations on Twitter, Facebook and YouTube. "Gang members made the mistake of boasting about their shootings on Twitter which NYPD officers used to help establish their complicity in murder and other crimes," said Police Commissioner Ray Kelly at a Thursday press conference announcing the indictment. Authorities said the gang members engaged in a violent struggle for control of Brownsville that erupted into shootings, one of which killed a gang member and another that left an innocent bystander dead from a bullet to the head. Residents lived in fear of the gangs, authorities said, because they would target rivals in public places. Police recovered 35 guns when they arrested the gang members on Jan. 17 and 18, authorities said.